To celebrate the start of the Holidays we have a special deal. 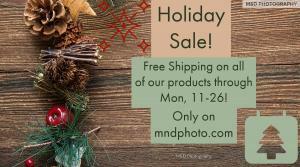 Free Shipping on all of our products! No minimum purchase and good through Mon 11-26-2018. Great gift ideas for everyone on your list! One question that people often ask me is how do you actually make an income online? Last year I made over $22,000 and on track for $30,000 this year but its not easy! I figured I would post a few quick tips to help those starting out. 1)It takes time! Don't forget that patience is a virtue, there are literally thousands of sites and people who are trying to sell online. Persistence is key when you're first starting out. When you don't see a dollar in your first six months, keep going! 2)Create Create Create. In your first few months try to develop a niche and keep at it. You can look anywhere online and see what's selling best but don't try to duplicate those, come up with your own version. The more you have available to purchase the better odds you have of selling. 3)Marketing is key. It takes a long time to gain thousands of followers but you can get there. Try to expand your reach beyond just one base, I use Twitter, Pinterest, Google, Instagram, and several other sites to reach followers. 4)Don't limit yourself to one discipline. I started off with photography then turned my free time into editing, adding textures, etc.. Now I find myself painting digitally and on actual canvas. This is not an open invitation to throw up a bunch of crap and hope it sells. Actually take time to learn how to master different disciplines and go from there. 5)Talk to people! If you aren't comfortable approaching people like me there are other ways. Use business cards or other real world methods to leave behind at different locations. When travelling I often leave my card anywhere I know people might visit. It might sound corny but it drives traffic to my site! 6)Take time out of everyday to help your business. It's hard to find free time anymore, most people have kids and full time jobs... I don't and that gives me an advantage. However, anyone can skip that show on tv, get up an hour earlier, go out for sunset instead of taking a nap. The point is if you are truly dedicated you will and must find a way to get that time in! 7)Going along with number 6, be aware of your surroundings. The world is filled with art, whether it's a mountain an hour away, perfect light shining in on the kitchen table or spilled paint on the floor. Be inspired! Get inspired! You'll find when you take time away from your everyday routine to just be aware it gets easy. 8)Be willing to take a cut in pay. Can you live on less that what you earn now? If the answer is a definite no then walk away now. I enjoy simplicity and don't need the next newest most expensive thing. Everyone wants to become rich online, search google and you'll see tons of pages on how to strike it rich. The odds of getting rich doing what I do or you inspire to do are slim to none. So cut some corners and see how much you can save. 9)Going along with number 8, manage your money. 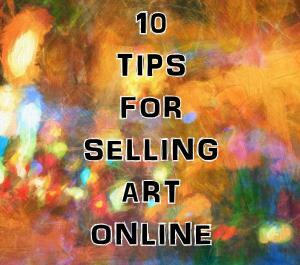 You'll find that there are busy times of the year(Christmas) and slow times(usually mid-Summer) This varies but lots people shop online anymore for the Holidays and mid-Summer people are on vacations or outside, not online browsing art. That means if you make $4000 in December you might only make $1000 in July, manage accordingly. 10)Maybe this should have been Number 1-Find a great support system! Whether it be family, friends, your spouse, etc.. I am blessed with an understanding wife who supports me regardless of the situation. For our one year anniversary and a Christmas in July theme we have reduced all of our prices! Not only that but the $100 wine coupon at nakedwines.com still stands, visit our site for all rules. Thanks for your views and business, it is appreciated!